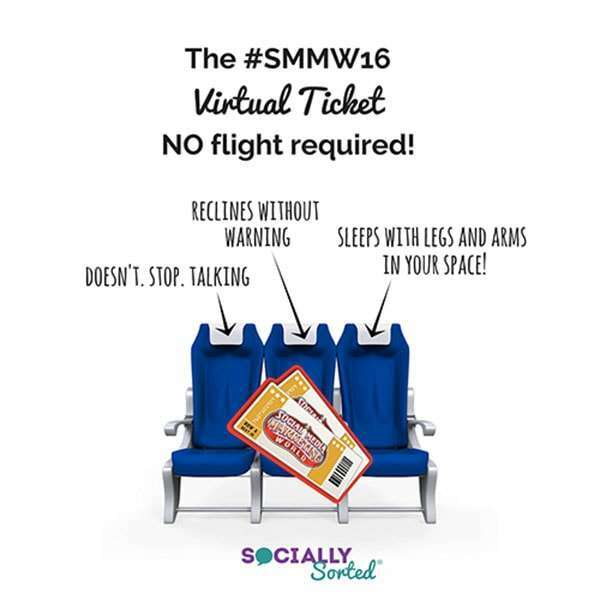 Do you have a serious case of FOMO about not attending Social Media Marketing World 2016? Then read on my friend – I have just the ticket for you. 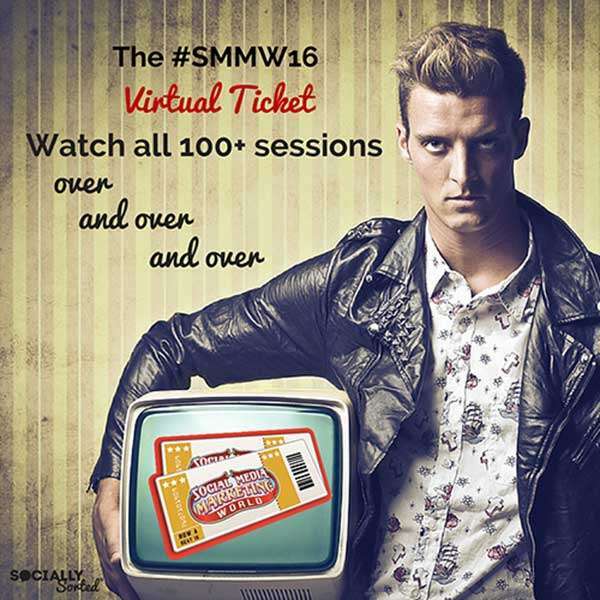 Social Media Marketing World Virtual Ticket for 2016, to be precise. No jet lag. You can watch in your PJs. You can catch EVERY session, anytime, anywhere. Let me tell you how. Just last week this blog, Socially Sorted was announced as one of Social Media Examiner’s Top 10 Social Media Blogs in the World. I will be at Social Media Marketing World in April 2016 as I am a speaker again this year (my 3rd year speaking and 4th year attending). Yes, it’s SO worth it for those of us that can wrangle a live ticket and the transport and accommodation costs of going … but it’s not possible for everyone. Even some of my US friends can’t make it every year for various reasons. So…. the VIRTUAL ticket is the next best thing. In fact, it may even be a better option for many of you. #1 You can watch 100+ sessions over and over and over. For those of us that like our home comforts and the ability to watch or work from anywhere… the Virtual Ticket is awesome. Quite literally you don’t even have to be dressed at all if you don’t want to but I thought that PJs would make for a more shareable image. And less awkward. And if you ARE a lucky duck and live in the United States, but just can’t get there for any myriad of reasons, then…. ditch the flight. Go virtual instead. You can network from the comfort (and security) of your own laptop in your home. I’m part introvert so I get you – I get overwhelmed after a few days of crazy conference scene, so I know that for many introverts the virtual pass is an attractive option. But…. did you know you can network like a trooper from the safety of your laptop or smartphone? The Virtual Ticket is your pass to networking – no matter how you like to do it! Snap up the Virtual Ticket (leap at it) as it’s currently $297 (discounted from $697) for early birds! That’s it! 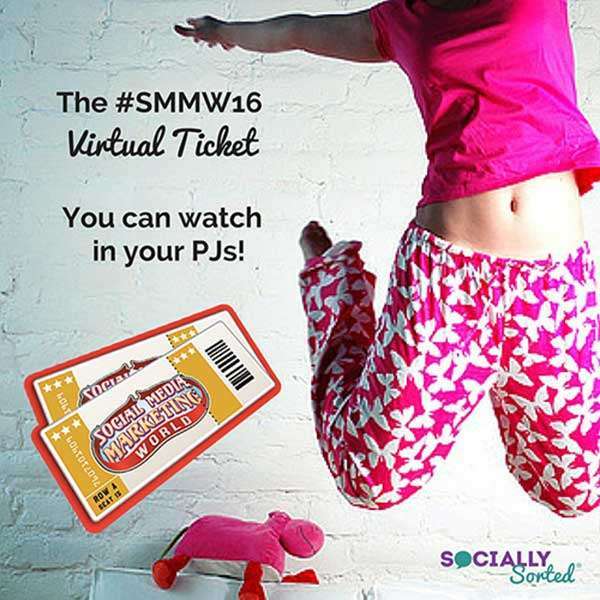 I hope you’ll consider joining me (even if it’s virtually) at #SMMW16 – even if it is with Social Media Marketing World’s Virtual Ticket. If you do, remember to say hi to me on Twitter as I will be engaging a lot throughout the conference, as will all of the other speakers. 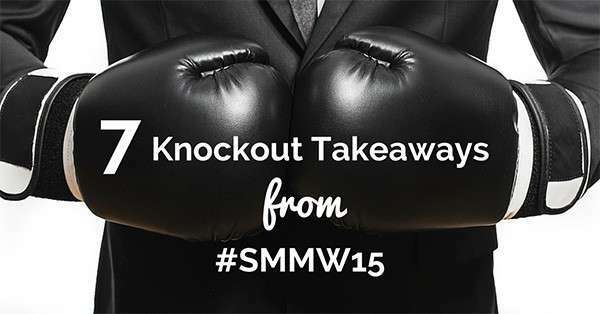 Check out this post below for my Wrap from Social Media Marketing World 2015 – it was an awesome event and it will give you a taste of what you will get on the Virtual Ticket. And be sure to check out this SlideShare too – it’s packed with Quotes from SMMW speakers – just like you will hear this year! NOTE: I am a proud partner of Social Media Examiner in promoting this event. If you purchase a ticket through my affiliate link I will receive compensation. I only recomment products, services and events that I use and LOVE personally, and I think you can tell already that I crush a little on Social Media Examiner so I know you’ll love it. 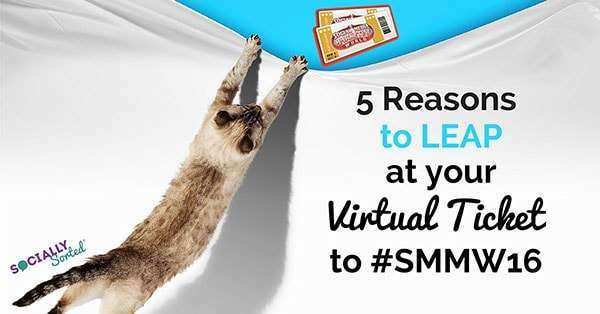 Will you be joining me live (or virtually with a Social Media Marketing World Virtual Ticket) this year in April? Click to check it out..